Custom clothing is becoming one of the hottest fashion trends in the world today. Sewing can also help you create amazing curtains, your own purses, and many other things that you use every day. In order to meet your needs, you’ll need one of the best sewing machines helping you out! With one amazing machine, you can fuel your creativity for years to come! There are a lot of sewing machines available today. Some have electronic, computerized features while others provide basic stitching patterns. Which is right for you? The chart below is the perfect place to start! What Are the Different Types of Sewing Machines? Sewing machines can come in several different variations. In order to choose the best sewing machine to meet your needs, you’ll need to consider what specific type of machine you’ll need. Manual sewing machines: These are your basic sewing machines that can run either automatically or with the use of a foot pedal. Many of them today have about a dozen internal stitches that are built into the design of the machine so you can customize curtains, quilts, and clothing with ease. Automatic sewing machines: These machines operate in the same way as manual sewing machines do, but everything is fully automated. That means you won’t have to worry about your thread tension and sometimes you can even stitch on autopilot. Computerized sewing machines: These machines typically have more built-in stitches, sometimes up to 600 different options. You’ll also be able to connect these sewing machines to the Internet to download firmware updates and even more stitching patterns. The best sewing machines in this class have USB ports and one-touch stitch selection convenience. Embroidery sewing machines: These are the sewing machines you’ll want if you are trying to create intricate patterns. 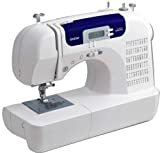 Many of these sewing machines will also offer monogramming functions and the ability to connect quilting squares and other custom sewing items together. Other sewing machines will give you the option to sew leather and other heavy-duty items. Serger sewing machines will help you create highly customized items like ruffles! By evaluating what you hope to accomplish with this tool, you’ll be able to select the perfect category to meet your needs. How Do You Find the Best Sewing Machines? First and foremost, you’ll want to look at the operation of the bobbin when considering a sewing machine. Everything from thread tension to threading the needle lies with this one tiny spool! Look for options that allow you to quickly insert a new bobbin and pull the thread through the needle so you can get started right away. For sewing machines that need a custom bobbin, look for automatic winding features that are independent of the actual sewing mechanism. The best sewing machines also have front-facing eyes for their needles so they are a lot easier to thread. There’s less wasted time because you don’t have to try to thread the needle from the side and try to fit your fingers or a pair of tweezers into a small area. The best sewing machines are also heavy enough that they’ll create an established footprint where you install them. If you’re feeding material into your sewing machine and it wobbles, there’s a good chance that you’ll skip a stitch or two as a consequence. Look for good dogs that will help feed materials at consistent speeds without bunching up the material at the needle. What Are the Advantages of the Best Sewing Machines? This all depends on what your needs happen to be. If you’re creative and love to sew, then a sewing machine can help you do anything from attaching a handle to a purse to attaching a spaghetti strap to a blouse. For those that love to quilt, embroidery machines can make fast work of a pattern while still give you some customization features while providing a hand-stitched look. Simple sewing machines can provide you with a straight stitch so you can create beautiful cuffs, hems, and collars. Sewing machines also allow you to create custom fashions, which is the hottest trend in the clothing industry right now. You can get clothes that actually fit you and potentially even turn your new sewing machine into a business if you find you’ve got the sewing skills! Sewing machines also help you create curtains, blankets, and other useful items that you need every day. To make sure you get these advantages over the course of years instead of months, it is important to read the best sewing machine reviews on each make and model. What good is a sewing machine if it smokes out in a couple months? Our fact-based reviews will help you find the best sewing machines at the most affordable prices so you can get the perfect combination of form and function in your home today. How Much Do the Best Sewing Machines Cost Today? If you’re shopping on a website like Amazon, you’ll find that there is a pretty extreme price range available for sewing machines. Entry-level models are priced in the $100-$200 range and will provide some basic stitching, buttonhole options, and other immediate features that you may need. On the other hand, a sewing machine that can do custom embroidery, blanket and quilt stitching, and still provide a basic sewing experience on a professional scale may cost more than $3,000! For the average shopper, a high quality sewing machine can typically be found for less than $500. In return, you’ll be able to get a computerized, fully automatic sewing machine that will let you get your sewing chores accomplished quickly. If you don’t want computerized or automatic features, then you can save about 50% on the MSRP of each unit by eliminating them. The first thing that you’re going to notice is the large variety of patterns and stitches that are available to you with one and two-touch convenience. You’ve got over 250 different sewing patterns at your disposal and four different fonts which you can use as well. For utility and decorative stitching, you’ll find that the Juki HZL-F600 will blaze right through your materials and let you easily express your creativity! Click here to look at pricing on Amazon and buy now on the Juki HZL-F600. It’s the easy threading system that initially stands out when you see the Singer Stylist in action for the first time. It has an automatic needle threader that actually works and won’t make you feel like you need to visit the chiropractor just to make sure your sewing machine is ready to go. It also has an electronic autopilot so you don’t have to sew with the foot pedal, but still be able to achieve maximum sewing speed. 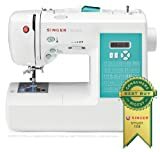 Click here to look at pricing on Amazon and buy now on the SINGER 7258 Stylist Computerized Sewing Machine. The nicest aspect of using the Brother Serger 1034D is that you can quickly switch your stitch width with just the turn of a dial. You can go up to 7mm for some of your boldest designs, especially when you consider the fact that the free arm is actually removable. This machine also competes with some of the best high-speed machines on the market today, providing you with up to 1300 stitches per minute! If you’ve never used a serger before and you’re ready to take your sewing to the next level, then the Brother Serger 1034D is one of the first sewing machines you should consider. It isn’t one of the best sewing machines on the market today simply because it’s priced at an affordable price point. Click here to look at pricing on Amazon and buy now on the Brother 1034D Serger Machine. We really loved the actual design of the push button commands the most with this particular sewing machine. So many designs require you to push buttons all over the machine to get the custom stitch you want. With the Janome 8077, all of your commands are centrally located so you don’t have to waste time trying to find the right button. Pattern stops, needle up/down commands, and everything else you need is right at eye level. Add in the Start/Stop button that allows for a pedal free performance and you’ll find one of the best sewing machines there is! Click here to look at pricing on Amazon and buy now on the Janome 8077 Computerized Sewing Machine. The feature that we really loved with this computerized sewing machine is that you can directly connect it with your computer. This gives you access to literally thousands of different embroidery designs that you can directly import into the sewing machine and use in the future. You can also download firmware updates for the Brother SE400 that will let you digitize designs in just moments so you can focus on your creativity instead of your connectivity. Click here to look at pricing on Amazon and buy now on the Brother SE400 Computerized Sewing & Embroidery Machine. Instead of getting the standard 11 stitches like you would with other entry-level sewing machines, Janome offers you an experience that gives you 18 utility and decorative stitches and a 4-step automatic buttonhole. You can select the stitch that you want with a dial that you turn with just a quick flick of the wrist and locking stitches are easy to thanks to the reverse lever that is in a natural place in the case design. It really is the best sewing machine if you’re looking for a compact companion! 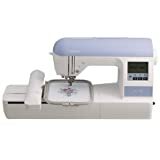 Click here to look at pricing on Amazon and buy now on the Janome Magnolia 7318 Sewing Machine. The sheer number of embroidery designs and lettering fonts is what makes this Brother model one of the best sewing machines around right now. You’ll receive over 130 unique embroidery designs and 6 different lettering fonts to help your creative ideas begin to flow. From florals to scrollwork to quilt patterns, there are 10 different frames and a dozen different border styles that will help you finish off your custom artwork. What we loved most of all, however, is that you don’t have to keep fiddling with memory cards or USB flash sticks in order to get your favorite designs to your sewing machine. Click here to look at pricing on Amazon and buy now on the Brother PE770 5×7 inch Embroidery Machine. We really loved the included instructional materials that come with this Juki. 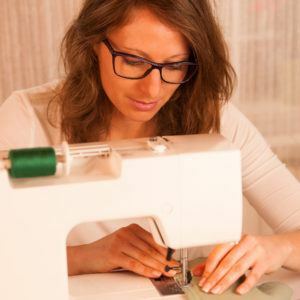 A good serger can be quite intimidating to people who have never used one before, especially if you’re used to a pretty standard, entry-level sewing machine. It has an all-metal construction with a differential feed and all of the accessories you need to get started come straight out of the box. If you’re looking for high value at a fair price, this all-in-one package offers you what you need! Click here to look at pricing on Amazon and buy now on the Juki Pearl Line MO-654DE Serger. Although there really isn’t such a thing as a plug and play sewing machine, the Janome 8002D Serger gets about as close to it as possible. It ships with a how-to DVD and all you’ve got to do is play with a few scraps of fabric after watching the video to get the feel of the machine. Fine tune it and you can have something ready to go within an hour of taking it out of the box. Many machines are engineered in such a way that it makes it incredibly difficult to use them for the first time, but not so with this machine. It’s easy to read and that makes threading it a simple chore. Click here to look at pricing on Amazon and buy now on the Janome 8002D Serger. The primary advantage that comes with this particular sewing machine is the built-in free arm. Unlike other sewing machines at this price point, it allows users to be able to sew cuffs and sleeves quickly and easily. Want to sew a hem for the pants that your kids are going to soon be wearing? Not a problem! With a 25 year limited warranty included with the price, the Brother CS6000i offers a quilting table, buttonholes that auto-size, and ultimately a faster way to sew. If you’re looking for a sewing machine that has lots of options, a smooth operation, and few complications, then this is definitely a sewing machine to consider. Click here to look at pricing on Amazon and buy now on the Brother CS6000i Sewing Machine. Today’s best sewing machines come with many advanced features that make it easy to start sewing for the first time or transition into being a professional. 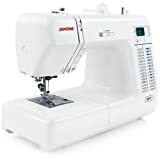 Use the best sewing machine reviews that you’ll find on this site to make an empowered decision that will meet your needs and you’ll be ready to experience the joys of modern sewing today!